Quite a bit happened this week, and you can really sense that the series is getting ready to wrap up. Octavian is busy trying to clean up the morality of Rome, but is having difficulty keeping his own family in line. In reality, it’s his own fault since he tried to keep Antony and Atia apart and was oblivious to Agrippa’s affections for his sister. Regardless, his heavy-handedness resulted in Antony’s banishment to Egypt and Agrippa’s decision to break up with Octavia, but not before she could drop a pregnancy bomb on Agrippa’s head. Octavian: Tell me, how would you like to be married to me? Girl: I would like that very much if my husband does not object! Maecenas was in the middle of everything this week and I was really hoping that Lucius would lay him out when they were questioning him about the missing gold. Down on the Aventine, Titus’ world is turned upside down as Eirene dies from a miscarriage caused by Gaia’s treachery. Gaia is scary-hot, and it looks like she might work her way into Titus’ good graces. The only thing that could blow that deal is if the alchemist decides to tell someone about what Gaia bought from her. Kudos to Chiara Mastalli’s work in Eirene’s death scene – it was amazing. You could literally see the life leave her body. 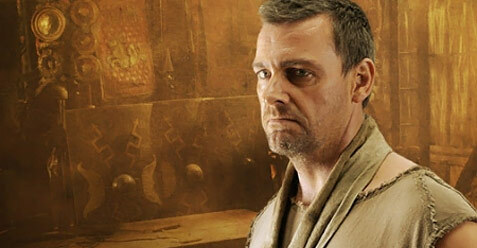 Lucius’ discovery of his daughter’s betrayal leads to his decision to leave for Egypt with Antony. Titus was kind enough to take responsibility for his children and for the business, but it’s a lot to ask of the big man. Memio’s makeshift alliance with the other captians runs into a brick wall on the Aventine. He underestimated Titus’ ferocity in the wake of his wife’s death. And did you see the way Gaia handled herself in the battle? She and Titus probably belong together. Even though she’s inherently evil and he’s inherently good, they both solve problems in the same way – with violence. Titus killed his competition when he murdered Eirene’s husband. Gaia did the same thing – only she did it intentionally. The fight at the end was one of the best ever on TV or film. You knew Memio was in trouble, but they set up the scene perfectly, and Titus will go down as a classic character. I was glad to see a true love story within all this brutality. That is between Antony and Atia. There actually was a soft, touching moment when he told her he would send for her as he left for Egypt. I nearly had a tear in my eye for the poor love sick creatures. Wow, is this show HOT! I agree with you in the aspect that Titus and Gaia should be together because they share the same personality traits when it comes to ‘just down right mean’. Only Titus does have a heart…unless Gaia rips it out of him when he’s trying ‘to give her another beating’. The plot is all so rushed. It’s like the last 5 minutes of an exam when you still have to write down everything before turning in your paper. While I enjoy the plot twists, they are happening too fast. I wish they could just leave some characters happy, like Pullo, instead of trying to completely change his life in the last 2 episodes. Hi,It is really a interesting story and true love story.There are soft and touching moments.Last two episodes are very interesting.I watch this episodes daily.